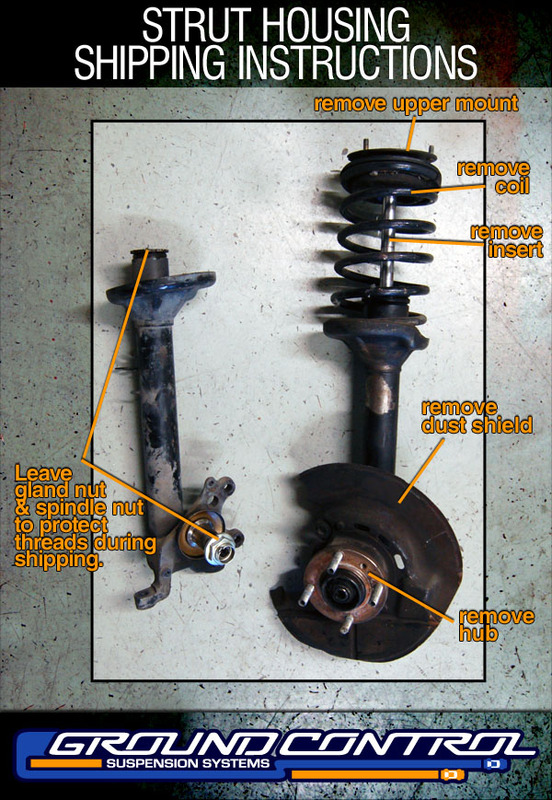 Ground Control e30 suspension are for 50-51mm front struts only. If you have 45mm struts (318 and 325e usually) please call to learn about updating your strut housings. Select Option B = If you would like to cut the perch off and weld on a new smaller steel perch. Select Option 1 = If you would like to keep standard length housings. Select Option 2 = If you would like instructions on how to shorten your strut housings. Select Option 3 = If you would like to send us your strut housings to weld. Select Option 4 = ﻿**WE ARE CURRENTLY OUT OF STOCK ON E30 STRUT HOUSINGS** If you would like Ground Control to provide you core E30 Housings, the Core charge will be +$400. 2 Ground Control / Koni double adjustable strut inserts, bolted into existing housings. 2 Rear ride height adjusters and upper perches.